Dag van de Wol is probably translated as ‘The Wool Day’ but I think more literal translation to ‘The Day of the Wool’ has a nice ring to it, a sentence in which the focus is well and truly on the Wool having its day 🙂 It was an event held here annually in Holland (aka The Netherlands) and it took place this year on Saturday, two days ago already! I am sorry I didnt get this post up earlier, but as suspected, yes, got a bad headcold. Its seriously holding up mental activity. Also enthusiasm. So you need to make some allowances and add some imagination to this post, because however enthusiastic I sound in this post, please multiply that by at least eight to get the ‘actual’ amount of enthusiasm that I had on the day, before I got sick. The Day of the Wool was held in a small place quite a hike from where I live, mostly because there are a couple of major rivers running through the country, which of course don’t have bridges conveniently placed just for me, so it was a bit of a dogleg from here to Oijen. A nice drive though and it was really a beautiful late summer day. Its held on a farm, so a nice rural setting, and most of it is inside a big barn generally used for horse riding, so a good size and covered in case of rain. Handy, but not needed on Saturday. 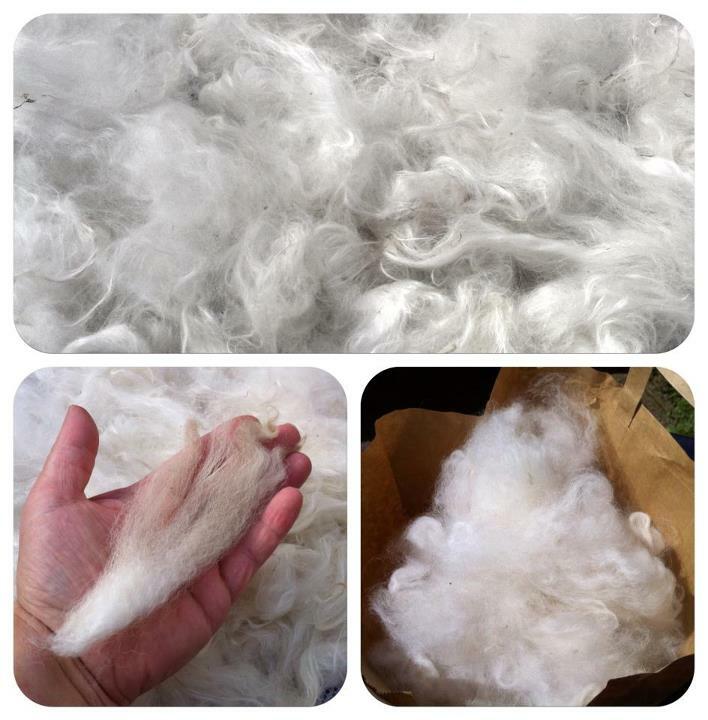 When I got there I first looked for Marian and her Alpaca Milestones stand, she has already supplied me with some amazing quality alpaca fleeces, currently being hoarded and exclusively used for my Lord of the Rings Elven yarns, they’re THAT magical! I found her and a whole lot of lovely fiber, gorgeous colours, gorgeous textures, and I was pleased to stop and have a chat. I hope to be able to make it to the next spinning/knitting day at her place soon, had a lovely time last time. 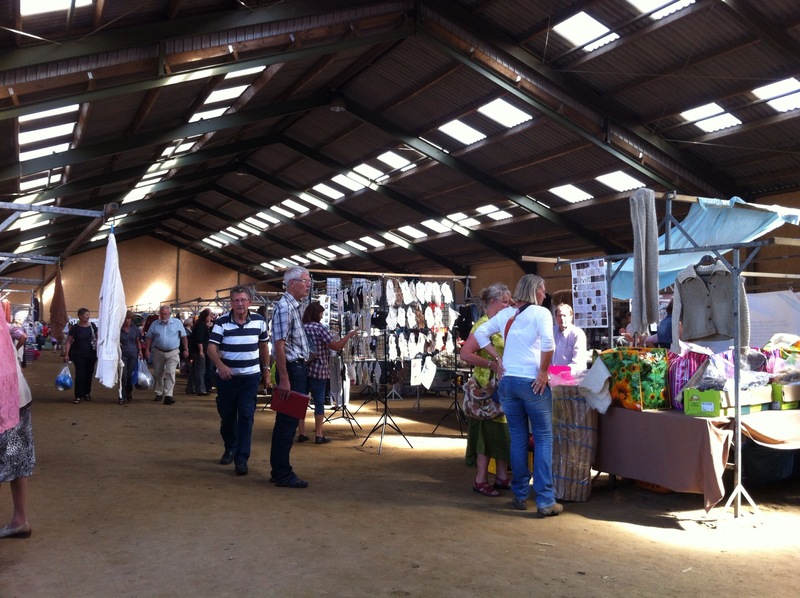 Opposite and along a bit from Marians stand was a guy surrounded with raw fleeces, rolled up on the temporary wooden floor, hanging around on a frame, smaller amounts in bags… first thing to catch my eye was all the Wensleydale he had, but the next thing had me reaching for my wallet. He was busy talking to someone when I arrived and so I was checking out this fleece thinking, wow thats loooooong long locks on that fleece.. too long for Wensleydale, I was thinking. 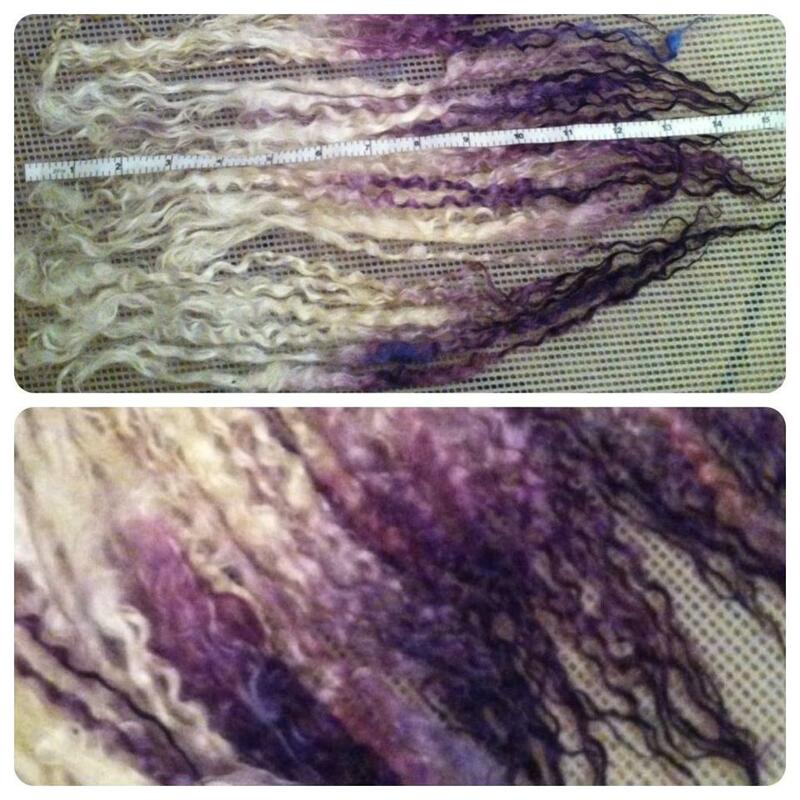 I instantly thought ‘Masham’ because it was hanging like dreads, with this incredible length, it wasnt lustrous enough to be Teeswater, but it was a bit grubby so I wasnt really sure, but I was getting excited thinking it might be Masham! I never saw one in real life! 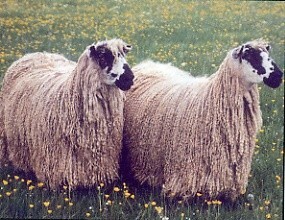 Turns out this guy goes over to the UK and buys fleeces there to sell here, and YES this was Masham, from the north of England, first shear (after the lamb shear so about 15 months growth) and seriously, I washed and measured these locks and they are all around FIFTEEN inches! And they do have a nicer luster than I expected as well, I am very happy with this fleece! There were lots of other stands inbetween, a Kromski dealer with all sorts of wheels and equipment, I was a lot tempted by some beautiful spindles but am already struggling to find time to spindle spin as I would like to, so I didnt buy.. But the stand I am going to tell you about now was an exciting one, Lia, whom I have met before at a couple of different workshops, has just launched her new shop! 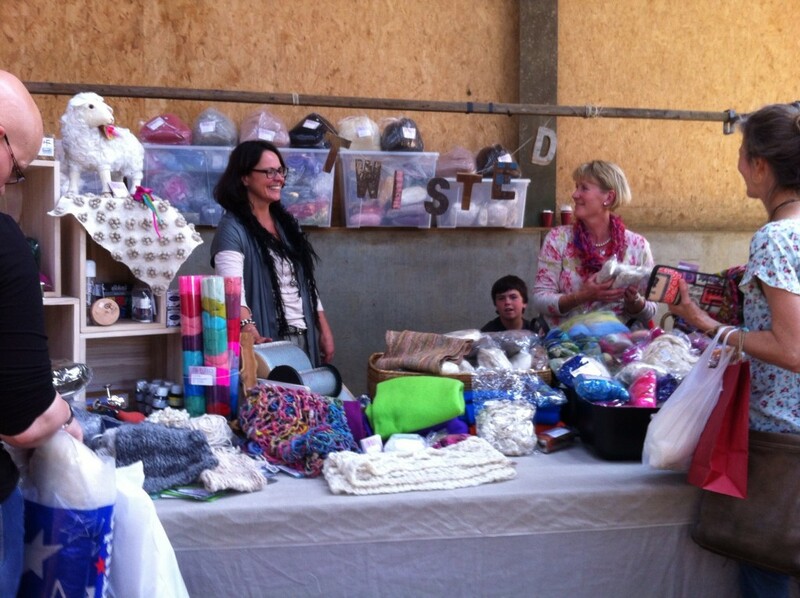 Its called Twisted, and is an online shop for spinning equipment and supplies, and what I was particularly pleased to see was the amount of activity and interest around her stand, particularly for the beautiful art yarns she was selling! Here in Holland, knitting and crochet as a hobby is just taking off, or reviving now, and I can tell you its pretty unusual to see a whole bunch of art yarns at a market, and people were clearly very interested! Great to see! I said hi to Lia, and wandered off for a cold drink and a yak with Esther Perfors, who had also arrived with husband and kids, so our boys were off sprinting and building up a thirst pretty quickly 🙂 We also had a surprise ‘hello’ with Annick Keters, another fellow-art yarn-workshopper, and after an invasion of wasps, we went back in, to see that not only did Lia still have lots of interest in her stand but she also had someone having a try out of her Country Spinner – pretty adventurous! I almost feel like I was there now! And thank you AGAIN for sharing your magnificent find with me, I am GIDDY! Woweee!! What a haul you made on the Masham!! I have never seen it “real” before. Did you have a problem combing it out? Is that a natural color or did you dye it? What do you do with the alpaca? 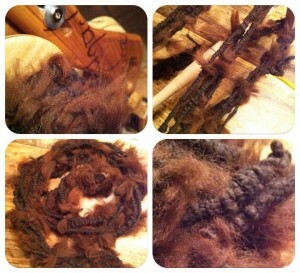 Spin, weave? I finally figured out that it has to be blended with wool or something else to keep it from stretching if it’s for knitting–learned the hard way!! Hi Elaine! Its a pretty cool fleece isnt it! What you see in the photos are the uncombed locks, I just separated them out and washed them individually to keep them nice, and then dip dyed the ends, they were so long, I thought it would be fun to have them change colour 🙂 The alpaca is spun, I dont know about the stretching, its 100% pure, I can knit a swatch and see how the stretch is, but it doesnt feel stretchy in the skien, maybe even less than wool, maybe it depends on how its spun? 40 stands is a very nice amount here! And that long fiber is awesome, the colour you dyed it in too. I have no idea what to expect when it’s spun, I’m really curious to see that! But seriously, no I haven’t tried that yet, it sounds really cool, I’m going to look into that!